Figure 5.4 Neuropathic ulcer over a bony prominence in a patient with neuro-osteoarth-ropathy its base is clean, covered by healthy granulating tissue. Therapeutic footwear was prescribed (extra depth shoes with an orthotic insole and a window under the ulcerated area) and the patient was advised to minimize his activities. The ulcer healed in 3 months. Ulcers in patients with midfoot collapse recur very often. Prevention of new ulcers over the same bony prominence is achieved by prophylactic surgery (osteotomy of the prominent bone). Preservation of plantar ligaments is essential, since their extensive resection may cause progression of the rocker bottom deformity. A 74-year-old female patient with type 2 diabetes diagnosed at the age of 62 years, was referred to the outpatient diabetic foot clinic because of callus formation on her right sole. She was being treated with insulin and had a history of hypertension and ischemic heart disease. shoes and orthotic insoles were prescribed in order to accommodate her deformed toes and relieve the load under the metatarsal heads. 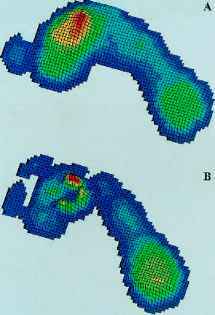 Post-debridement in-shoe pressures when she used her own shoes showed a significant load under her metatarsal heads (Figure 5.9 Panel A). The maximum pressure in this area was 282 kPa; however, after insertion of an orthotic insole the maximum in-shoe pressure was reduced to 155 kPa (Figure 5.9 Panel B). The ulcer healed in 8 weeks. pressures alone do not cause foot ulceration; a combination of different risk factors (mentioned in Chapter 1) is necessary for the development of ulceration. Demineralization of the foot bones is not common, but when this occurs it signifies an adequate circulation, which is a prerequisite for bone resorption. Localized, mature periosteal reaction and demineral-ization involving metatarsal heads is common in diabetic patients with neuropathy. Its etiology is poorly understood. 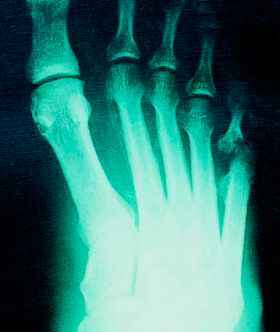 Focal oste-olysis of phalanges, metatarsal heads, and other single foot bones, as well as stress fractures of the metatarsal heads can also be seen in neuropathic patients. 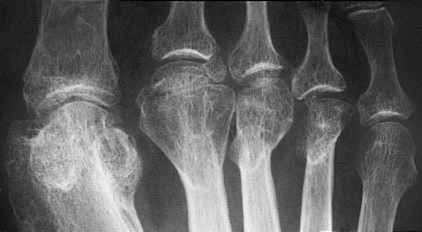 Bone resorption at the phalanges may be so extensive that a part or even a whole phalanx may be resorbed. 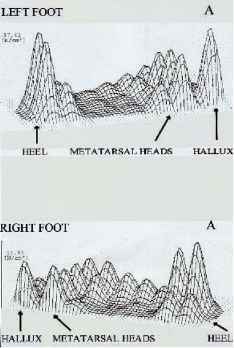 Metatarsal resorption usually starts from the metaphysis and extends to the epiphysis sparing the diaphysis. Bones which have become demineralized may have a pencillike appearance. This 32-year-old type 1 female diabetic patient, diagnosed at the age of 16 years, attended the outpatient diabetic foot clinic for chronic neuropathic ulcers of her feet. She was treated with intensive insulin treatment. The patient had a renal transplant at the age of 30 years, because of endstage renal failure due to diabetes, and she had laser treatment on both eyes at the age of 28 years. Soon after her transplantation she noticed a bulla under her last three left metatarsal heads which readily ruptured and a superficial ulcer developed. She also reported an ulcer of 2 years' duration under the third metatarsal head of her right foot. She had never been instructed in foot care and had never worn the correct footwear. She had two small children and had not been taking good care of her feet. The patient was being treated with erythropoietin injections, cyclosporin, methylprednisolone, mycofenolate mofetil and furosemide. On examination she was found to have bounding pedal pulses, and severe diabetic neuropathy. The vibration perception threshold was above 50 V in both feet bilaterally. 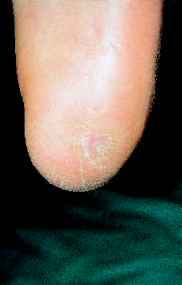 right third metatarsal head a neuropathic ulcer was noted in an area of gross callus formation, in addition to claw toe deformity (Figure 5.11). A callus was present under her right fifth metatarsal head over a bunionette deformity. Mild callus formation was observed on the heels of both feet. Onychomycosis affecting all toes was also present (discussed in Chapter 8, see Figure 8.7). her own shoes (Figure 5.12). She had standard treatment on a weekly basis and the ulcers began to heal slowly. Six months after her first visit, an ulcer developed under her left third metatarsal head and a callus under her right fifth metatarsal head (Figure 5.13). New shoes were prescribed with orthotic insoles: the in-shoe peak pressures were reduced from 33.3 to 16.83 N/cm2 under her right, and from 37.42 to 20.13 N/cm2 under her left foot (Figure 5.14). The patient continued visiting the outpatient foot clinic almost every week, and 6 months after her first visit her ulcers had healed. 3 years previously. One year before his first visit to the foot clinic the patient developed an ulcer on the lateral aspect of his left foot which resulted in osteomyelitis and surgical debridement of the metatarsal bone. After a femoral-popliteal bypass graft in his left foot, the patient developed neuro-osteoarthropathy. He presented to the outpatient clinic with two painless ulcers under his first and third metatarsal heads surrounded by hemorrhagic calluses. 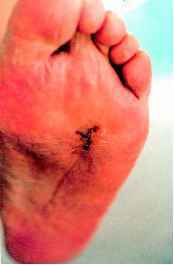 Hyperkeratosis under his fifth metatarsal head and a scar at the site of the surgical debridement were noted (Figure 5.15). The graft was functioning well and the patient had no claudication. Debridement of the ulcer under his fourth metatarsal exposed the bone (Figure 5.16). Cultures were obtained from the sloughy base of the ulcer—a positive sign of infection — and the patient was treated with an empirical combination of cotrimoxazole and clin-damycin. The patient did not attend follow-up, therefore no X-ray or any further studies are available. shunting, hypervascularity and demineral-ization. Some cases are reported to occur after bypass surgery of the arteries. Exposure of the bone denotes osteomyelitis and it should be treated accordingly. 2 diabetes since the age of 38 years and treated with insulin, was referred to the outpatient diabetic foot clinic because of a chronic non-healing ulcer under her right heel. She had good diabetes control (HBA1c: 7.2%). Four months before her first visit she noticed a painless blister on the right heel caused by a small stone in her shoe; the blister ruptured and since the patient did not feel any pain she did not give her foot any attention. Some discharge was present on her socks, but it was the patient's daughter who saw a superficial ulcer on the right heel. The patient visited a primary care clinic and was advised to clean the ulcer with povidone iodide and apply clean dressings every day. A 2-week course of antibiotics was prescribed. She continued her daily activities and after 4 months the ulcer was still active. from the ulcerated area were prescribed (Figure 5.18). After 6 months the ulcer had healed completely (Figure 5.19). Figure 5.20 Neuropathic heel ulcer caused by shoe seam usually on the posterolateral aspect. Excessive walking in new shoes can cause blister formation on the posterior aspect of the heel in patients with neuropathy. Shoe seams may also cause ulcers on the heel (Figure 5.20). 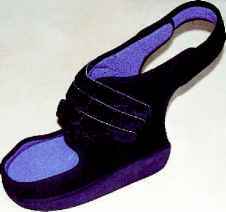 Therefore shoes and socks without seams are prescribed to patients with loss of protective sensation. Heel ulceration is difficult in management since debridement in this area precludes functional weight bearing. Major amputations are often necessary when heel ulcers are infected. 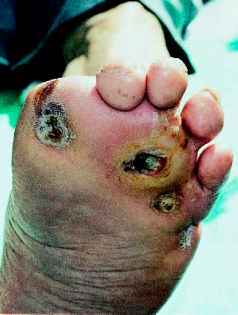 A 55-year-old male patient with type 2 diabetes since the age of 43 years attended the outpatient diabetic foot clinic due to ulcers on his feet. His diabetes was poorly controlled with sulfonylureas and he had a history of a disarticulated left great toe at the metatarsophalangeal joint due to osteomyelitis. On examination the patient was febrile; peripheral pulses were palpable, the ankle brachial index was 1.2; the vibration perception threshold was over 50 V in both feet; temperature, light touch and pinprick sensation were absent as were the Achilles tendon reflexes. 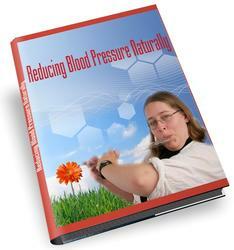 Blood pressure was normal; no other diabetic complications were found. HbA1c was 11.0%. There was a perforating dirty ulcer on the outer aspect of his right foot. A large amount of callus had built up around the plantar orifice (Figures 5.21 and 5.22). The patient reported edema of the forefoot which had recently subsided as was evident from the scaling of the skin. 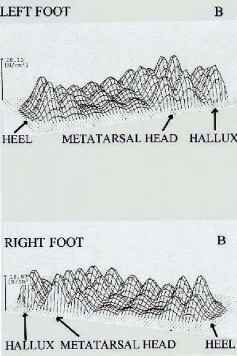 Callus formation was also observed over the second, third and fifth metatarsal heads of the left foot. The patient was empirically treated with ciprofloxacin. continued ciprofloxacin treatment; cotri-moxazole was added for almost 6 months and the ulcer gradually healed (Figure 5.24) with the help of therapeutic shoes. Instruction in appropriate foot care was provided. 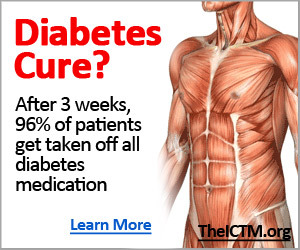 The patient visited the outpatient clinic erratically; callus formation on the site of the healed ulcer was removed every 3 months; he refused strict glycemic control as he was afraid that episodes of hypoglycemia would jeopardize his position at work. He used intermediate-acting insulin at bedtime and sulfonylureas during the day. His HbA1c remained at 9.0% during the following year. Preventive footwear was not accepted. The patient attended the clinic 2 years later because of multiple burns over the tips of his toes and superficial ulcers over the fifth metatarsal heads of both feet (Figure 5.25). He had put his feet in front of the fire in order to dry out his wet socks. No pain was felt. Although the patient was aware of the burns he continued his activities for a week before this visit. Full thickness burns were present over the tips of all toes. Blisters over the right fifth metatarsal head and the left fourth and fifth toes were removed and ulcers had developed since the patient was still working regularly, despite medical advice to the contrary (Figure 5.26). Calluses formed around the new plantar ulcers. Amoxicillin-clavulanic acid treatment was initiated and the patient attended the diabetic foot clinic on a weekly basis. All ulcers healed within 2 months except the one on the right great toe, which was complicated by osteomyelitis and acute soft tissue infection. Five months after the burn his right hallux had to be disarticulated. The patient still refused preventive shoes and 4 months after this second amputation new ulcers developed under the fifth metatarsal heads bilaterally (Figure 5.27). 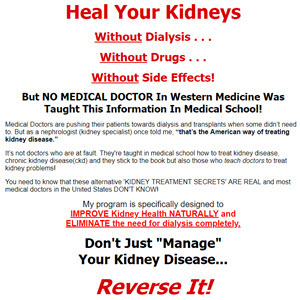 the treatment 1 year before his first visit, when overt nephropathy developed. He had excellent diabetes control (HBA1c: 6.4%). On examination his feet pulses were bounding (ankle pressure index 1.2 bilaterally); he had severe peripheral neuropathy: no sensation of pain, light touch, vibration or temperature; the vibration perception threshold was 48 V on the left and above 50 V on the right foot. A full thickness clear neuropathic ulcer surrounded by callus was observed under the right first metatarsal head, with dimensions of 3 x 3 x 0.5 cm (Figure 5.28). 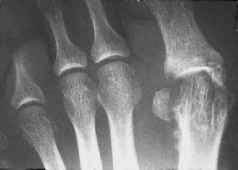 Mild claw deformities of the toes and displacement of the metatarsal fat pads to the base of the proximal phalanges due to muscle atrophy were also noted. Sharp debridement was carried out and special extra depth shoes with an orthotic insole were prescribed. Care was taken to offload pressure from the ulcerated area. 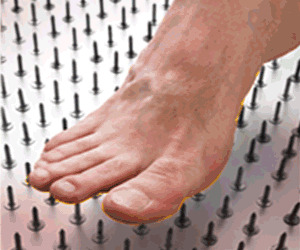 The patient was advised to limit his daily activities and he attended the diabetes foot clinic on a weekly basis. The size of the ulcer was reduced by half within 4 weeks. Two weeks later, after a professional trip, the patient visited the clinic again. His ulcer was infected and a large amount of callus had formed around it. His right hallux had a 'sausage-like' appearance and signs of infection were observed (redness and edema). A culture from the base of the ulcer revealed the presence of Staphylococcus aureus and Enterobacter cloacae post-debridement. 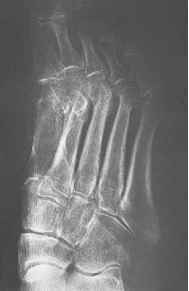 A radiograph at that time showed mild erosion of the first metatarsal head. The patient was given treatment with cotrimoxazole and clindamycin. The radiograph was repeated 2 weeks later and extensive erosion of the first metatarsal head was revealed (Figure 5.29). Acute osteomyelitis was diagnosed. The patient continued with the antibiotics for 12 weeks and had regular chiropody treatment on a weekly basis. The ulcer healed completely in 20 weeks (Figure 5.30). • Clindamycin 600 mg x 3 orally or 600 mg x 3 i.v. • Ciprofloxacin 750 mg x 2 orally, or 400 mg x 3 i.v. Fluoroquinolones, teicoplanin and van-comycin should be prescribed for methi-cillin-resistant staphylococcus only. Fluoro-quinolones in particular, should always be combined with another anti-staphylococcal drug in the first month of treatment, since it is likely that a resistant strain will prevail in the infection.